Hello Spring! I didn't even know today is the First Day of Spring until yesterday! Coincidentally, this blog post I have prepared is quite appropriate! Yes, more pink indeed, but also culottes! Culottes are one of my favorite styles to wear in this transitional season. There is a bit of cold breeze leftover from winter but also warmer days eagerly waiting for summer. Culottes function as pants but feel more like skirt, flowy and airy. Needless to say, I was thrilled when I saw these dreamy blush pink pair! I styled them with a delicate lace top, lovely floral pumps, and this incredible pink saffiano leather crossbody tote! So there you have it, first official outfit of Spring! 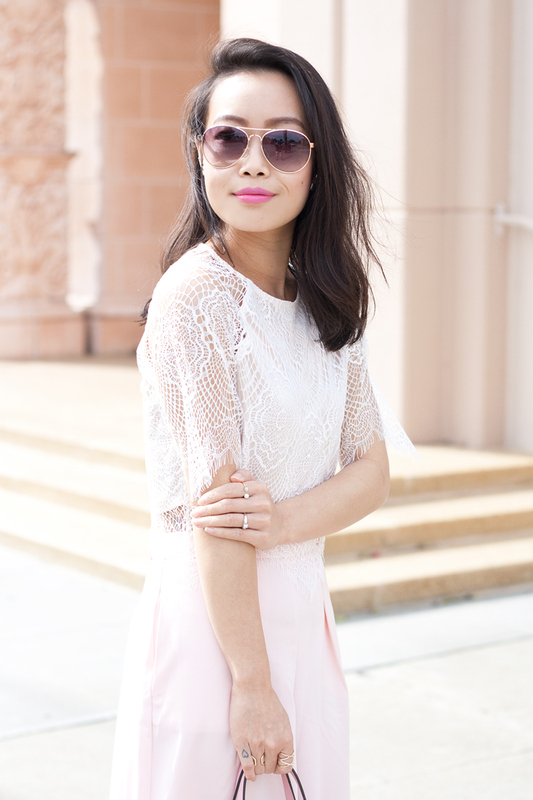 Blush pink pleated culottes c/o F21. Floral pumps c/o Charlotte Russe. West 57th small crossbody tote c/o Henri Bendel. Cutout layered crystal ring c/o Sole Society. Lily blush double pearl earrings c/o Mas Femme. This is so sweety and lovely outfit...Love these shades of pink! Awesome shoes! very pretty outfit, I love reading your blog, Thank you!